Although more than 180 countries have signed the CTBT, the treaty can only enter into force after it is ratified by China, Egypt, India, Iran, Israel, North Korea, Pakistan and the US. Antonio Guterres said nuclear testing inevitably has a "catastrophic impact" on environment and health. 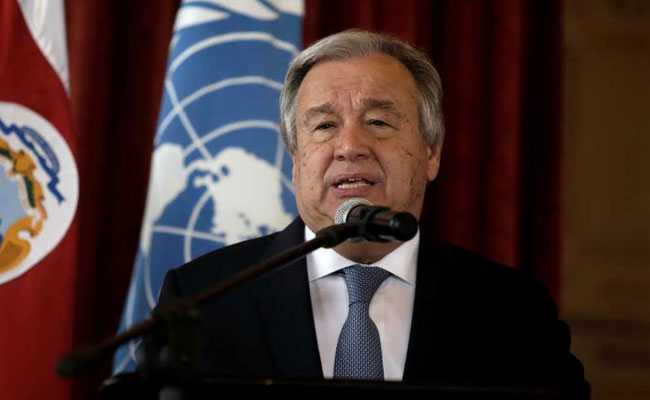 UN chief Antonio Guterres reiterated his appeal to eight nations, including India and the US, to ratify the Comprehensive Nuclear-Test-Ban Treaty, saying the failure to bring it into force undermines global efforts to ensure a world free of atomic weapons. Although more than 180 countries have signed the CTBT, and mostly ratified it, the treaty can only enter into force after it is ratified by eight countries with nuclear technology capacity, namely China, Egypt, India, Iran, Israel, North Korea, Pakistan and the United States. "Every effort must be made to bring about the immediate entry into force of the Comprehensive Nuclear-Test-Ban Treaty, CTBT. Yet, more than 20 years since its negotiation, the Treaty has yet to enter into force," the Secretary General said at a high-level meeting on Thursday, commemorating the International Day against Nuclear Tests. He said the failure to bring the treaty into force prevents its full implementation and undermines its permanence in the international security architecture. "I reiterate the appeal made when I launched my disarmament agenda for the remaining eight States whose ratifications are required for the CTBT to enter into force to commit to sign the Treaty and complete their ratification processes. I urge all not to wait for others to act before moving forward," he said, adding that the complete and verifiable cessation of all nuclear tests is a vital pillar of a world free of nuclear weapons. He said CTBT has an essential role within the nuclear disarmament and non-proliferation regime. Moreover, the UN chief pointed out that nuclear testing inevitably has a "catastrophic impact" on the environment, human health, food security and economic development. "That is why we should all welcome the robust norm against nuclear testing that has developed since the end of the Cold War, including through the voluntary moratoria implemented by most States that possess nuclear weapons," he stressed. Since the turn of the century, only the Democratic People's Republic of Korea, commonly known as North Korea, has broken this norm, leading to condemnation from the Security Council and repeated imposition of sanctions. What these tests have shown is that "no ad hoc measure can replace a global, legally binding ban on nuclear-testing," he underscored. By constraining the development and qualitative improvement of nuclear weapons, the treaty puts a brake on the nuclear arms race and serves as a barrier against States that might seek to develop, manufacture and use acquire nuclear weapons in violation of their non-proliferation commitments. Taking the podium, General Assembly President, Miroslav Lajcak, spoke of how nuclear testing escalates tensions. "They create openings for political miscalculations. And they bring us closer to the brink," he said. Turning to the CTBT, he bemoaned the fact that it has yet to become active. "We need a legally binding system; we need a clear verification mechanism; we need the CTBT to enter into force," he stated, urging the eight States required to ratify "to do so urgently." He hoped to see "tangible" disarmament action on the Korean Peninsula, noting that "verification is crucial for progress." On the annual observance of the International Day Against Nuclear Tests, Guterres highlighted the "inextricable connection" between testing and eliminating nuclear weapons across the world. "Last month I visited Japan and met with survivors of the atomic bomb attack on Nagasaki," Mr Guterres said. "Through the testimony of the survivors, the 'Hibakusha', we are reminded of the need to ensure that nuclear weapons are never used again." Hibakusha is the Japanese word for the surviving victims of the 1945 atomic bombings of Hiroshima and Nagasaki. The word literally translates as "explosion-affected people" and is used to refer to people who were exposed to radiation from the bombings. Mr Guterres also stressed the need to "remember the victims of the disastrous era of widespread nuclear testing."